Mint-flavoured Sprite? Ugh, good god. Still doesn’t sound as bad as lime-flavoured milk. Anyway, I’m not sure what to make of it. I haven’t actually tried it or anything (New Zealand is simply not that adventurous….come to think of it, few Western countries are), but one of the reasons I drink green tea so much is because it’s healthy. I believe a lot of people enjoy it at least partly for that reason. Making it into yet another soda seems to defeat that purpose entirely. How strong is the green tea flavour? Is it just like fizzy green tea? The strength of the tea is literally as if someone poured some (fairly strong) green tea into some Sprite. The end effect isn’t very strong, but a little stronger than the weak green tea you sometimes get in China. I agree that it defeats the health purpose, but my thought was: does this mean the Sprite is caffeinated?? I’m not sure. it’s been around for more than a year in the USA. pretty good actually. the green tea taste is much milder that what you describe. maybe Sprite thought they had to make it stronger for the Chinese palate !! Sorry, it’s the Canada Dry Green Tea Ginger Ale that dim-summary mentioned is what I meant to describe .. not green tea Sprite. Hmmm, sounds like a great drink! The Green Tea in green bottles is very popular, and… I guess more than a few young Chinese picked up 雪碧 thinking it tasted like Green Tea ( I tried explaining that lemon/lime is a popular combo in the West, and was met with confused looks ) and went away disappointed that it was too sweet, etc. I think companies get into a bit of trouble when they pander to local customs, etc (eg. serving sushi/rice in the Tokyo McDonalds).. but this one sounds impossible to resist. There’s been a Canada Dry Green Tea Ginger Ale here in the U.S. for a while now. Most of the stores that I’ve got it from just call this 雪碧茶。I’m addicted to this stuff, but lately I’ve been buying more ‘normal’ green tea ‘drink’ because of the 再来一瓶 deal.. The odds of winning a free bottle seem high, I win about 3 a week. The odds of being able to redeem it are a lot lower at most stores though. I don’t think mint sprite is that bad 🙁 Its like that mint water that comes from Chengdu – it cools you off in the summer! Also – I love green tea. And sprite. But I don’t like　the Sprite Green tea. Probably because the green tea flavor tastes like Matcha 抹茶 to me, instead of regularly brewed green tea 绿茶。 I’ve never been a fan of the Matcha flavor. I like it. But then I also like the 乌梅 soda that is said to taste like BBQ sauce on the first try. They make decaf green tea, so the green tea Sprite is probably still decaf, Pasden. I ran across the Green Tea Sprite a few weeks ago. It wasn’t too bad, but I haven’t bought it since. Guess I just like old fashion Sprite better. Canada Dry Green Tea Ginger Ale like dim_summary stated is really good. It’s been in the US grocery market for a couple years from my experience. You don’t see it on tap at any restaurants and it doesn’t make sense as I see lots of kids and adults mixing the generic “lipton iced tea” with soda at the fountains. John: I didn’t realize sprite was non caf and yeah, makes sense the tea is decaf too. With that said, what a waste of a drink! It’s like drinking decaf coffee, why? If you’re going to consume 45g of sugar (half a can of sugar literally) you better get a caf kick otherwise why drink it? I just bought this today based on your tip-off. Actually quite like it. It’s got a softer taste than regular sprite, but isn’t so strong on the green tea front that it becomes annoying. I wish I was around to witness spicy sprite, however. 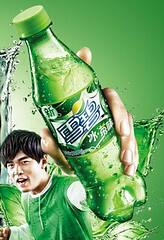 Why can’t Coca-Cola leave Sprite alone in China? Why does it keep coming up with freakish flavors? First Mint Sprite, then “Sprite on Fire”. Recently someone called to my attention the new Green Tea Sprite. Being the long-time Sprite connoisseur that I am, I had to try it. It wasn’t altogether bad, I guess. Not nearly as bad as Mint Sprite and Sprite on Fire (these two are reeeeaaly bad), anyway.